AMHERST, Mass. - University of Massachusetts hockey rallied from a two-goal deficit in the third period and completed the comeback with the game winner from freshman Philip Lagunov with 3.3 seconds to go in the first overtime period, defeating Vermont, 3-2 in game one of the squads' Hockey East Opening Round series at the Mullins Center on Thursday night. With the win, the Minutemen improve to 16-17-2 on the season, while the Catamounts fall to 9-19-7 on the year. "I didn't like the way we started," said UMass head coach Greg Carvel. "I thought UVM was more motivated to start the game. We were sloppy. I thought they were better in the first period and as the game went on we got better. It was a good playoff game-it was entertaining. Both teams played well, played hard. Our best players rose to the top. To get John (Leonard) back and score a big goal in the third period to get us going, Cale (Makar) scores probably the nicest goal you're going to see in college hockey this year. Our most skilled guys made the difference tonight." Vermont opened the scoring at the 13:09 into the first period. After UMass was unable to corral the puck in the slot, Matt Alvaro turned and flung shot past freshman Matt Murray to give the Catamounts a 1-0 advantage. UVM stretched the margin to 2-0 at the 16:46 mark of the second. Alvaro and Liam Coughlin set up Jake Massie's 5-on-3 power-play goal from the top of the right faceoff circle. For the first time this season, though, UMass erased a two-goal third period deficit. Freshman John Leonard scored 59 seconds into the third period with the Minutemen's five-minute man advantage winding down. 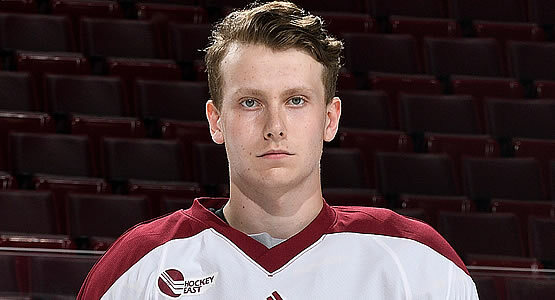 Classmates Oliver Chau and Cale Makar picked up the assists on the play. Makar added another power-play tally for the Minutemen at the 8:35 mark of the third, taking the puck coast-to-coast for his fifth goal of the season and second point of the night to bring him to 20 points on the year. Then, when it looked almost certain the teams would be playing a second overtime period, the Minutemen made one final rush up the ice. Lagunov redirected in a centering feed from Leonard with 3.3 seconds remaining in the frame, a play that went to a lengthy video review before the on-ice call of "no goal" was reversed. UMass finished the contest with a 41-33 shot advantage and went 2-for-5 on the power play, while the Catamounts were 1-for-5. The Minutemen held a commanding 51-for-86 (59.3) advantage over the faceoff dots, led by freshman George Mika's 14-for-21 (66.7%) showing. Murray totaled 31 saves in the win for UMass, while Stefanos Lekkas had 38 stops for UVM. The teams will be back in action tomorrow night, March 2, with game two of the best-of-three Hockey East Opening Round matchup set for 7 p.m. at the Mullins Center.